this is a quick post before I run out to see my favourite band, Paradise Lost, live. I was really excited as I love the colour. 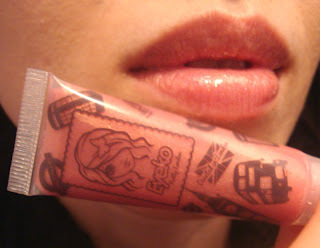 It's a very pretty colour, perfect to wear everyday and it has a lovely smell too! I tried photographing it on myself but failed miserably, so my lovely friend T. kindly offered to model it so I can take a decent photo to show you guys! Doesn't it look fabulous? She fell in love with the colour! Also as I am going to a metal live today, I wanted to paint my nails in a colour that would match my mood and outfit. 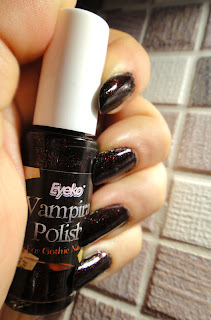 For this reason I chose the Eyeko Vampira nail polish. A lovely black nail polish full of dark red shimmer! Application was perfect and I had full coverage with two coats. Added a coat of Seche on top for extra shine and I'm ready to go! If you are interested in trying out these lovely products you can use my ambassador code E10053 or just click on the banner on the left. From all sales made this week an amount will be donated to the Japanese earthquake relief fund. Congrats! It is a beautiful color. And...have a great time at Metal Live. 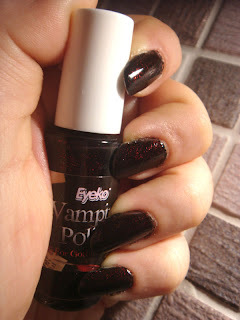 Vampira polish seems so lovely, I haven't tried it but I'm willing to :) As a first sale gift I received a gloss too, mine was Mayfair. Thank you everyone! The live was so much fun, Paradise Lost gave their best, it was a memorable performance!